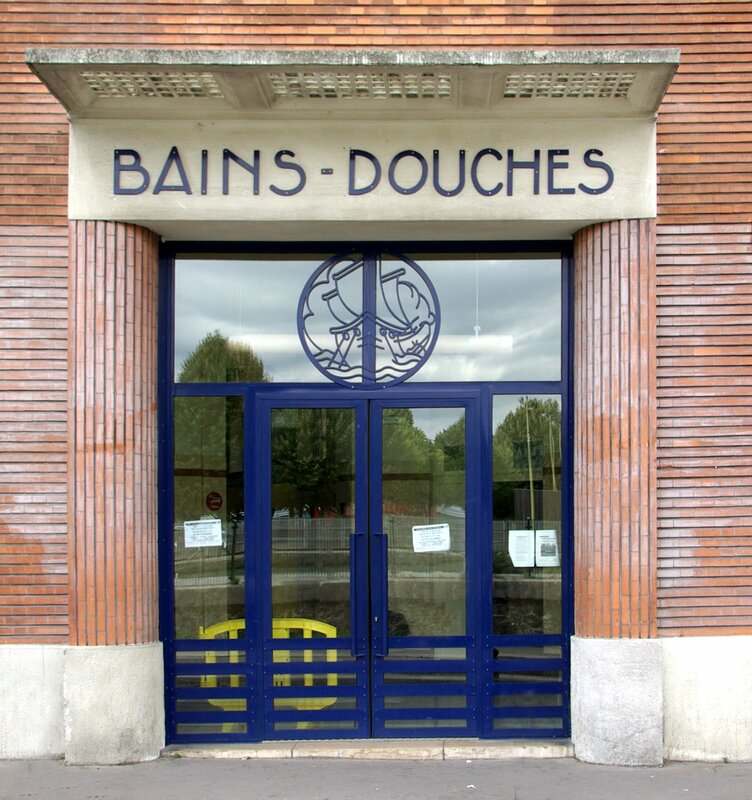 Those of you who were in Paris in the 80's (and even later) probably remember a mythical dance club called "Les Bains Douches" (public bath) precisely named so, because it was located in a former public bath. 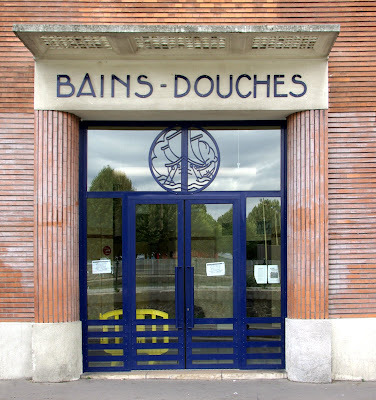 What is less known is that there are still public baths in Paris (18, if I counted well) and that it is still possible to wash yourself for free in one of them if you don't have a bathroom of your own (or if you're homeless). I photographed this one in the 19th arrondissement at Quai de la Gironde. The photo is not very good, but I love the building. 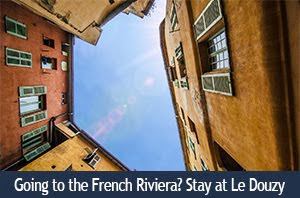 I can remember seeing one in the 5th (just across the Pont de la Tournelle) and decided to go in and have a look. The attendant gave me a tour. It was cleaner than my own bathroom at home I thought. Absolutely spotless. The attendant gave me a brochure with all the public baths listed. Just another reason to love Paris and its socially responsible ideology. I think the photo is good! And I also love the building. Am fascinated that there are public baths in Paris. Thank you for this interesting tidbit of information to begin the week. Oh boy, is Paris fancy! Here in Rio homeless people go into street fountains and bathe themselves carelessly in the dirty water. Oh wow, how cool is that. So Paris' bums have no excuse to be dirty. ;-) I agree the building is nice -- judging by the façade. My favorite kind of post, Eric, a great photo with an interesting bit of Paris life. The video link was interesting - they look so clean and nice. I love that Paris offers this for the less fortunate. My friend in Paris told me that there is also a law that every bar must allow you to enter and have a free glass of water if you'd like. If true, a nice law I think. Thanks for the photo! There are many public bath in japan but you have to pay around 4 euros. A very elegant Deco (or is it merely Deco-inspired?) facade. I particularly like the way in which the architect has continued the wave motif in the stained glass "portal" with the striated brickwork. 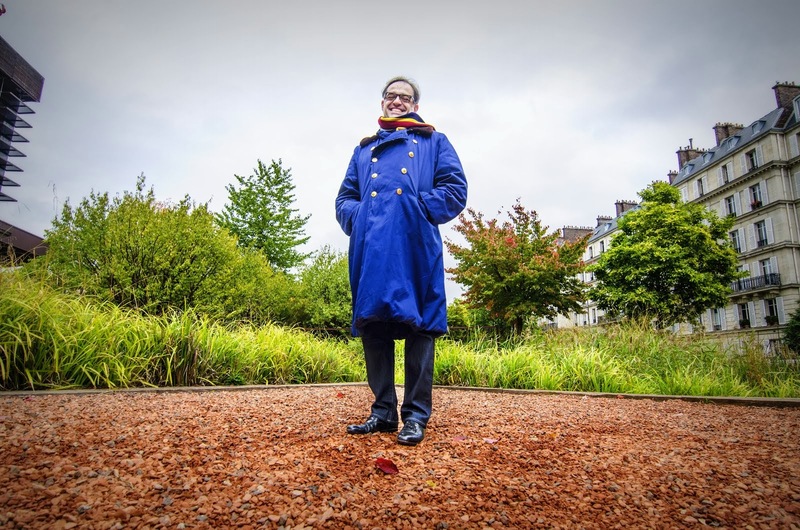 So, if you're going to be homeless in Paris, at least you know you can be clean! That is a comforting thought. Thank you, Parisians for making sure that everyone has some dignity, no matter how difficult their circumstances may be. Besides homeless people, I recall when I was a language assistant, plenty of the chambres de bonne did not have showers and only toilettes sur le palier so I'm willing to be that plenty of people in their 20s make use of the public baths. So nice of the French to have baths for the homeless and anyone who has no bathroom facilities. You wouldn't find that in the US...most homeless have NO place to go for anything!! I like your photo, it looks like a nice clean place from the outside anyway. Great post! This reminds me how much I wanted to try the Hammam. They have a huge one in Paris not too far from the 5th I believe, but I dony remember where it is. @lucio, I bet it really is Deco. Some of these facilities have been around for ever!